Set in the underworlds and hidden realms of Pakistan and India. 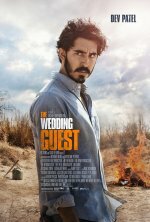 The Wedding Guest release date was Friday, March 1, 2019. This was a New York / Los Angeles release. Friday, March 8, 2019. This was a Expansion release. Jay (Dev Patel) is a man with a secret who travels from Britain to Pakistan to attend a wedding—armed with duct tape, a shotgun, and a plan to kidnap the bride-to-be (Radhika Apte). Jay and his hostage end up on the run across the border and through the railway stations, back alleys, and black markets of New Delhi.